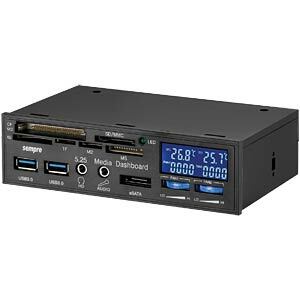 This multifunctional panel provides a card reader and other connections, such as 2x USB 3.0, HD audio in/out and 1x eSATA. The integrated fan controller with LCD display enables the user to monitor and control the temperature and speed of 2 fans simultaneously. More and more motherboards feature 19-pin on-board dual-port USB3.0 connections and the need for front panels with USB3.0 is rising every day. But most similar products have a catch: they are lead from the enclosure to the outside using complicated routes via adapters and slot brackets to connect to the USB3.0 connection on the back of the enclosure. This looks like a makeshift solution and is also inconvenient. In contrast, our solution is more elegant: it is connected directly to the motherboard using a USB 3.0 19-pin plug. 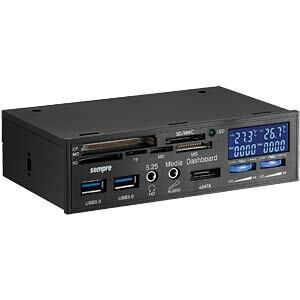 • Supports SM card, T-Flash, MS Select.0, xD, XD(M)Type, XD(H).MS, MS Pro, MS Magic Gate, MS-Pro Magic Gate, HS-MS-Pro Magic Gate, MS-DUO, MS Pro-Duo, MS Pro-Duo PSP, MS Pro-Duo Gaming, HS-MS-Pro Duo, MS-DUO MagicGate, MS Pro-DUO MagicGate, Secure Digital Card, Mini SD, Extreme SD, Extreme III SD, Ultra II SD, CF I, CF II, Extreme CF, Extreme III CF, Ultra II CF, HS CF, Micro Drive An adapter is needed for micro or mini cards.